It is because I cook, I garden. My garden started with pots of herbs. Today, I have 3 medium size raised boxes, enough for some of my favorites. Tomatoes and Persian cucumbers head that favorites list, but it is herbs that bring me to my garden daily. 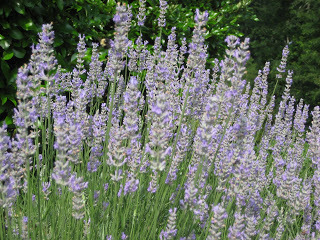 When I moved to Atlanta, I planted about 6 lavender plants(Provence variety). Lavender grows fast and in bloom it is not only a beautiful sight, but the smell is intoxicating. Occasionally I have stumbled upon recipes that use lavender. I once took a class at Roger’s Gardens in Corona del Mar, CA that actually first introduced me to lavender in food. Ideas for cooking with lavender were; Lavender Corn Bread, Lavender Honey Butter, Lavender-Scented Tuna Salad, Lavender-Infused Ranch Dressing, Lavender-Golden Raisin Dried Fruit Bread Pudding~just to name a few. So with my lavender at its peak, I decided to search out a recipe that tempted my taste buds. 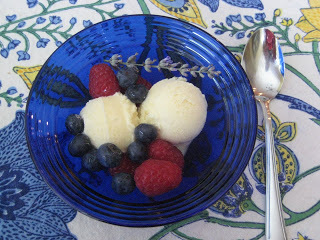 Out came cookbook after cookbook until I found it, Honey Lavender Ice Cream. 1. In a medium sauce pot, heat milk to just below boiling point. Turn the heat off and add lavender buds to milk. Steep for about 10-15 minutes. Strain the mixture and discard the lavender buds. 2. Return the strained milk to the pot and add cream and honey. Stir the mixture and heat until just warm over low to medium low heat. 3. In a medium bowl, beat egg yolks and salt together. Slowly add warm milk mixture, a cup at a time, to the egg yolks. Return entire mixture to the sauce pot and gently warm while stirring for about 5 minutes or until slightly thickened. 4. Strain mixture into a large bowl and refrigerate until completely chilled about 6 hours. 5. After 6 hours, using an ice cream maker, (I have a 1- 1/2 qt. Cuisinart Ice Cream Maker) pour chilled mixture into ice cream maker and process for about 20-25 minutes. Just a few Lavender Food Notes. A little lavender goes a long way in flavor so, do not be tempted to use more. Make sure to use culinary lavender and not lavender treated with pesticides or perfumed.